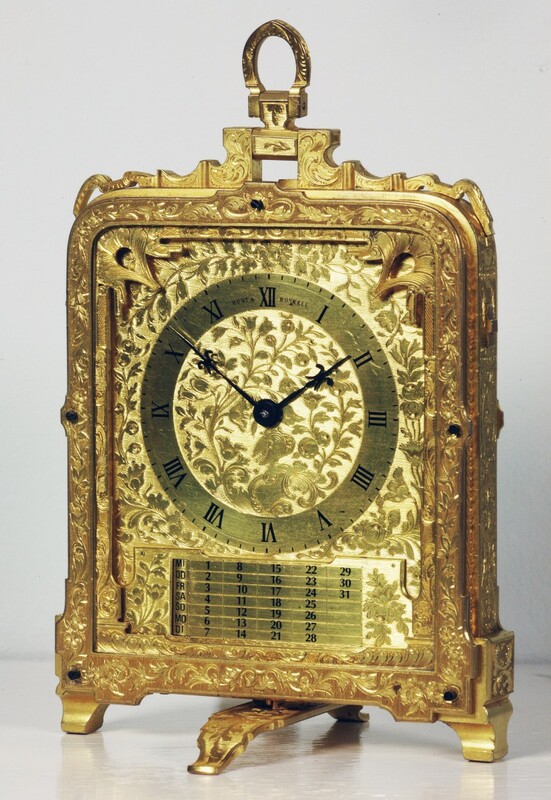 AN EXTREMELY FINE AND VERY RARE PRE-NUMBERED STRIKING AND REPEATING STRUT CLOCK. CIRCA 1845. 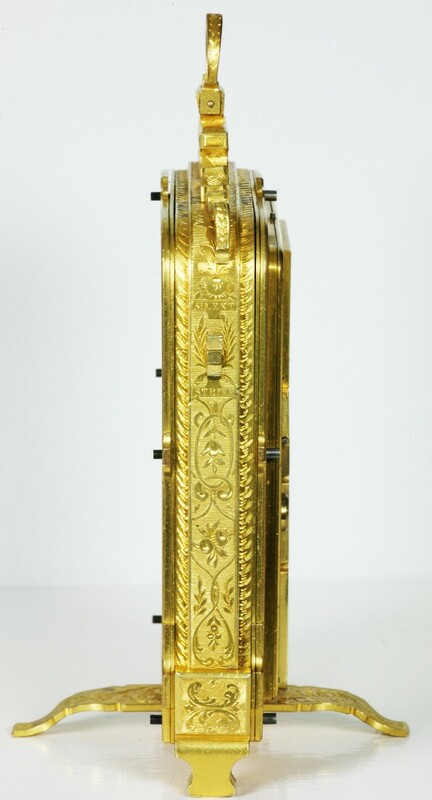 The multi layered case, in the typical form used by Cole, has a folding loop handle and is beautifully engraved all over. There is a sprung strut support on the backplate for resting at an angle, and a swivel foot underneath for standing upright. 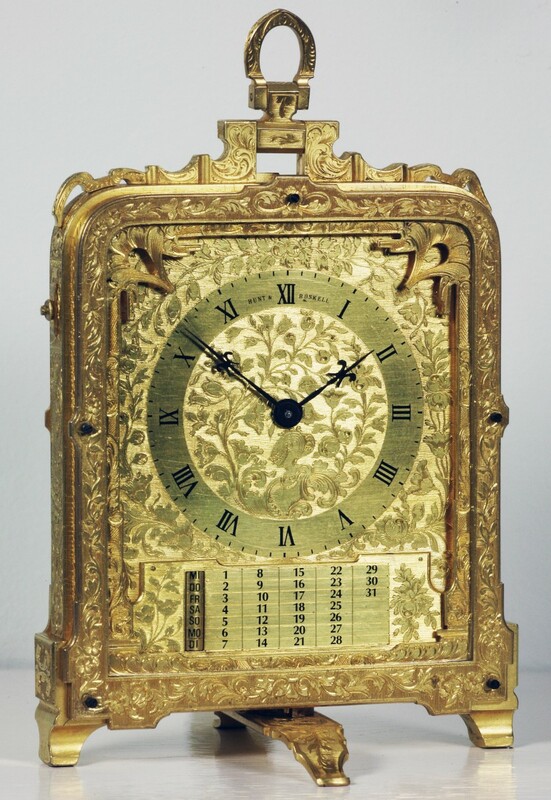 The gilded dial has foliate and floral engraving with fine matting between the engraving. It has a polished, gilded chapter ring with Roman numerals which is signed for the retailer ‘Hunt & Roskell’ with blued steel fleur de lys hands. 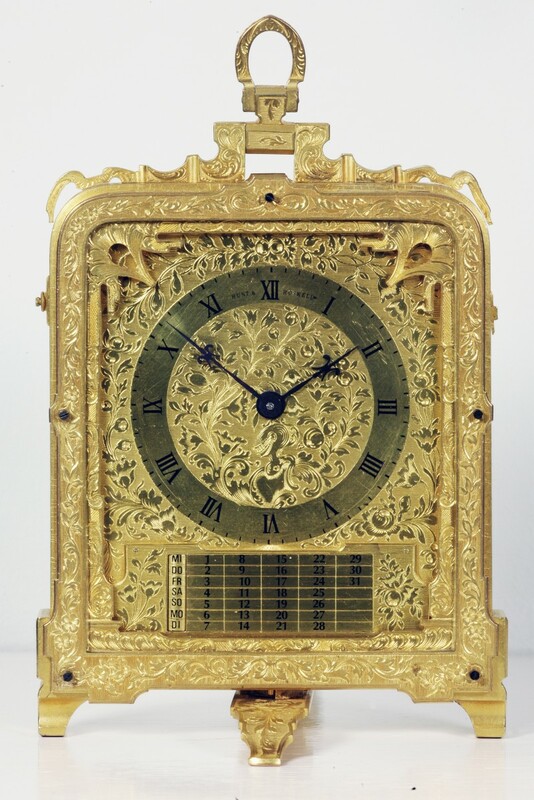 The manually adjusted calendar shows the days of the week which is adjusted through the base of the clock. There is a repeat slide on the left-hand side of the case and a strike silent/slide on the right-hand side. 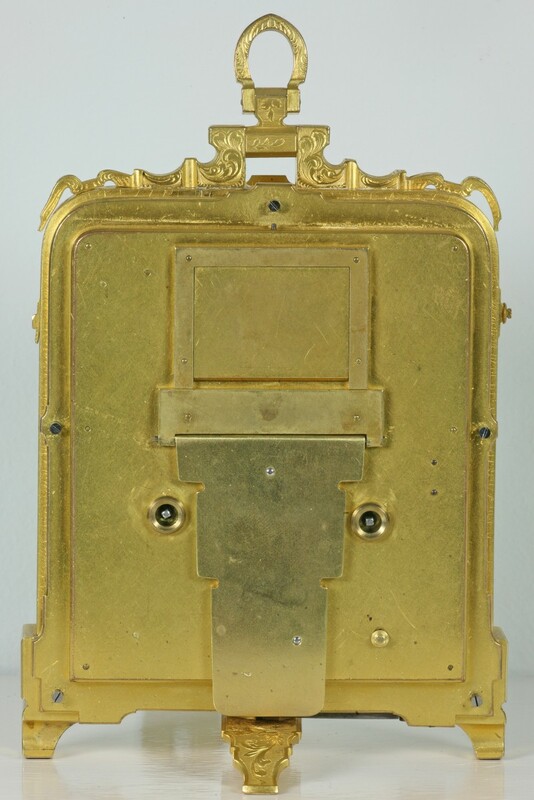 The eight-day duration two train spring barrel movement has a split backplate and is typical of the maker. 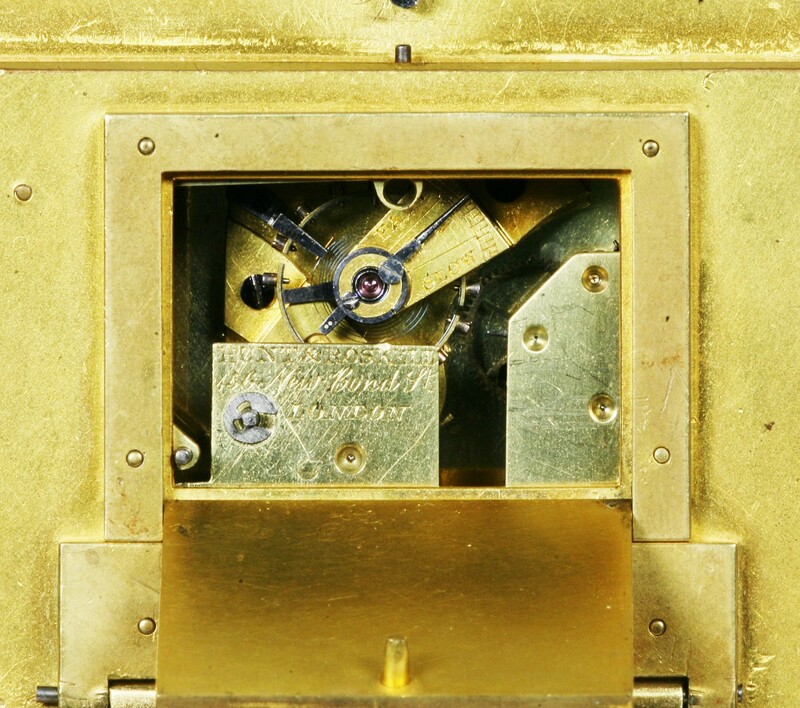 It strikes the hours on a gong and has a lever platform escapement with bi-metallic balance and poising screws mounted on the backplate. It is signed for the retailer ‘Hunt & Roskell, 156 New Bond Street, London’. 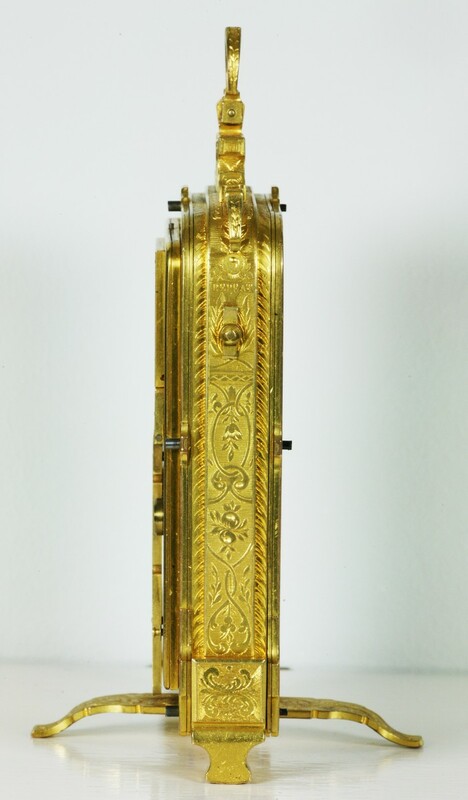 Striking strut clocks are rarely seen; this top-quality example with a repeat facility and a strike/ silent selector is extremely rare. Thomas Cole was born in 1800, the son of James, a clockmaker. Thomas went into partnership with his brother, James Ferguson Cole, around 1823 until 1829. The Great Exhibition of 1851 has Thomas listed as ‘Inventor, Designer and Maker’. 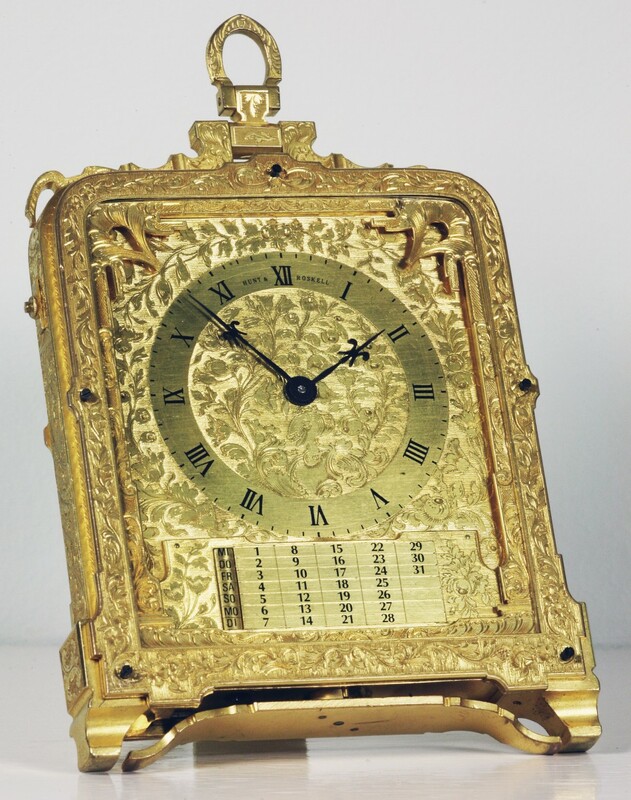 He was elected to the Royal Society of Arts on 28th June 1861 and was also admitted to the British Horological Institute in which his eminent brother played a leading role. He was awarded a medal for ‘Excellence of Taste and Design’ at the International Exhibition of 1862 and the jury, led by Charles Frodsham, had nothing but praise in their official report. Thomas Cole died on 3rd January, 1864. 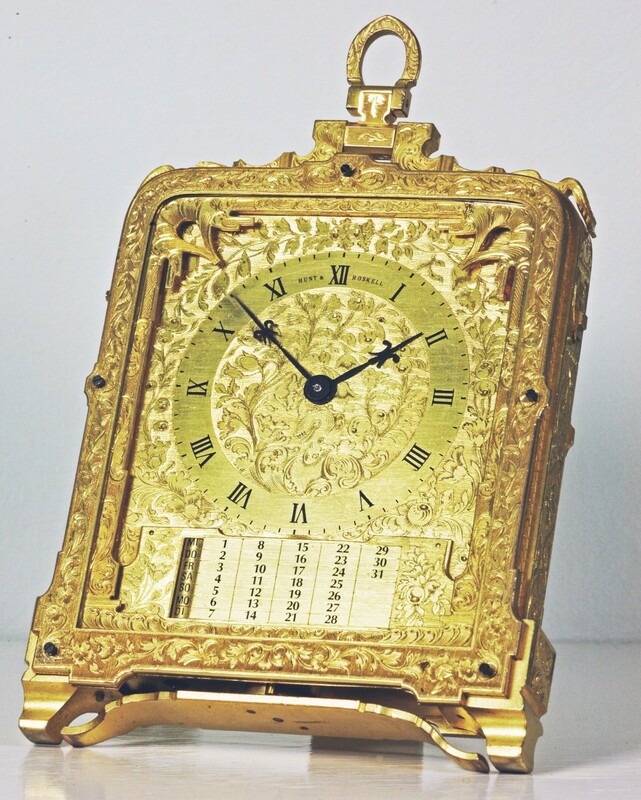 Further details can be found in ‘Thomas Cole & Victorian Clockmaking’ by J. B. Hawkins.